When you get behind the wheel of a car, you are operating an extremely powerful machine. Even though cars are commonplace in our society, they still need to be treated with care and respect to ensure the maximum amount of safety. Unfortunately, many of the millions of car accidents that occur each year in the United States are avoidable. Drivers often make simple mistakes that cause injuries or death to themselves or other innocent drivers on the road. As a car accident attorney, we often handle personal injury lawsuits for clients who have been injured by a negligent driver. This means that a driver was not doing their due diligence to keep themselves and others on the road safe while driving. We care about your safety and that of others on the road, so we have compiled a list of simple steps you can take to avoid some of the most common driving mistakes. Find out about some of the most common driving mistakes below and learn how to avoid them. If you remember from driver’s ed, you are supposed to look over your shoulder before changing lanes. However, many people do not do this. They think that because they’ve been paying attention to the road, they should know if a car is in their blind spot or not. However, it is not uncommon for cars or motorcycles to sneak up beside you without you even noticing. Before changing lanes, turn on your blinker and look over your shoulder to check your blind spot, even if your car is equipped with a blind spot detector. Don’t pick up your cell phone. 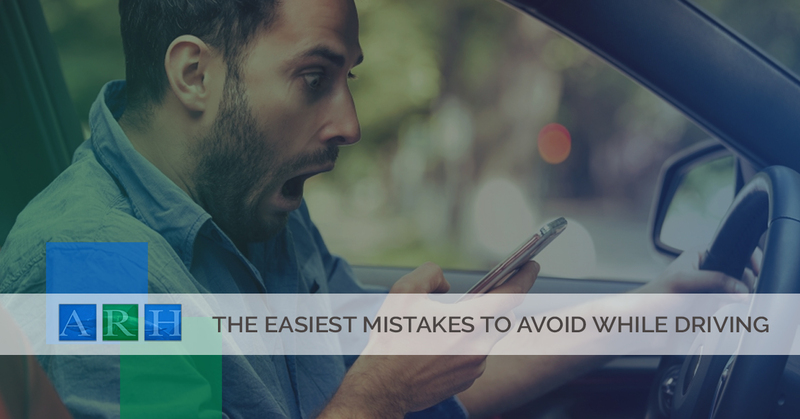 It can be tempting to look at your phone while driving. Whether you are changing your music, making a phone call, or reading a text (or worse, checking social media), using your phone while driving is always dangerous. If you can’t stand to ignore your phone, then take steps to create a safer way to use your phone while driving. First, set up Bluetooth so you can make phone calls hands-free. If you think your car is too old to support Bluetooth, think again. If you use your phone for music or entertainment, set up a playlist or podcast before you start driving so you can simply listen and enjoy instead of shuffling to find something to listen to. If incoming text messages or phone calls will be a distraction, turn your phone to silent or do not disturb mode. Different phones will have different variants, but most of them will easily be able to go completely silent with no notifications. If you have a smartphone, familiarize yourself with its voice command functions. Most smartphones today will recognize your voice so it can find directions, read text messages out loud, and send text messages on your behalf. Always scan ahead of you. Many drivers drive with tunnel vision — and not just when they’re in a tunnel. They only look at the road in front of them. This can cause you to miss hazards in front of you such as animals who are about to cross the road, bicyclists in the bike lane, or even wrong-way drivers. Always ensure you have a full view of everything in front and to the side of your car. Practice good scanning habits so you can see hazards and make adjustments to your route if necessary. Don’t make a left turn if you don’t have full visibility. Most people are guilty of doing this. You’re waiting for oncoming traffic to clear so you can make an unprotected left turn. The only problem? There’s another vehicle opposite of you in the intersection also waiting to turn left, blocking your view. When you “wing it” or “hope for the best” and make a left turn without having full visibility, you can easily become the victim of a serious car accident. One of the most common reasons that drivers say they do this isn’t because they knew the coast was clear, but because another driver was pressuring them from behind. We know this situation can be challenging, but make sure you are putting your safety before anything else. The car behind you can wait their turn while you wait until you have a clear view of any oncoming traffic. Always come to a full stop before turning right at a red light. In Texas, as in many states, you are allowed to turn right on a red light after you have come to a complete stop. The last part of that statement is often ignored. You are approaching a red light to turn right, you slow down and look to your left as you approach the intersection, you don’t see any cars, you look forward again to complete your right turn and wham! Out of nowhere, another car has t-boned you. It is imperative to your safety (and it is the law) to come to a complete stop at a red light before you turn right. That way you can fully assess any oncoming traffic before turning. Remember that oncoming traffic might be coming from your left, they might be turning from the other side of the intersection, or they might be making a U-turn from your right side. Check all three of these spots before turning. Speed limits are set by professionals who have deemed a specific speed to be both safe and efficient for a given area. This not only includes keeping drivers safe but also keeping pedestrians safe. It is easy to get carried away and drive above the speed limit, especially when you are in a hurry. However, it is always safer to drive at the speed limit and, if weather calls, below the speed limit. When you cut someone off, whether intentional or not, it can create an unsafe distance between you and the car behind you. It is especially dangerous to cut off semi-trucks or vehicles that might have a difficult time slowing down should you have to break once you maneuver in front of the vehicle. Make sure to leave plenty of space between yourself and another vehicle if you are going in front of them. Aggressive driving and road rage can be a major cause of accidents. Aggressive driving might include weaving in and out of lanes to pass cars, tailgating other vehicles, running red lights, honking your horn or making offensive gestures at other drivers, challenging other drivers to race, or doing other acts out of anger or frustration while driving. Not only does this create a dangerous situation for yourself and other cars on the road, but it might also provoke other drivers to act equally or more aggressive. Injured By Another Driver’s Negligence? Call Us! We hope that you follow the above advice to be a safer driver. Unfortunately, not everyone is so thoughtful. 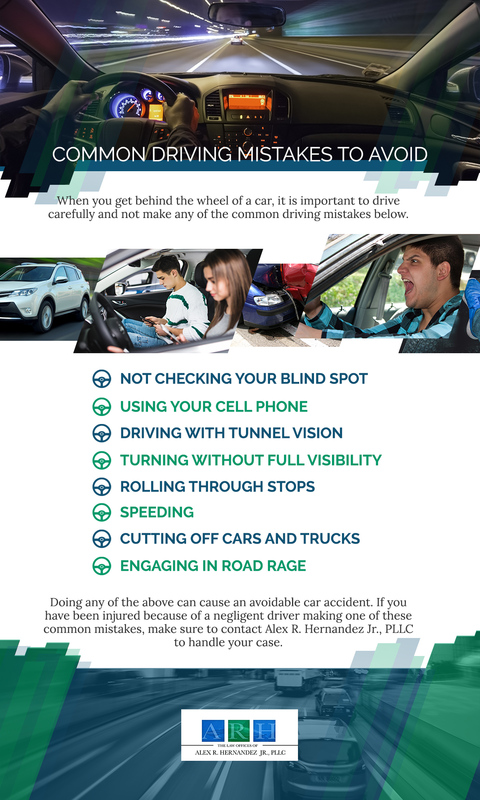 If you have been injured by the recklessness of another driver, contact Alex R. Hernandez Jr., PLLC to speak with a car accident lawyer. Our dedicated legal team can handle your personal injury lawsuit to try and win you compensation for your injuries, medical expenses, lost wages, and more. Contact a car accident attorney today to learn more.